Take a SNEAK PEEK at the first chapter of A Stitch in Crime – The second Thea James adventure & final installment in the popular Quilts of Love Series. “…Fans of inspirational fiction will enjoy the funny, feel-good whodunit.” Publishers Weekly Review. 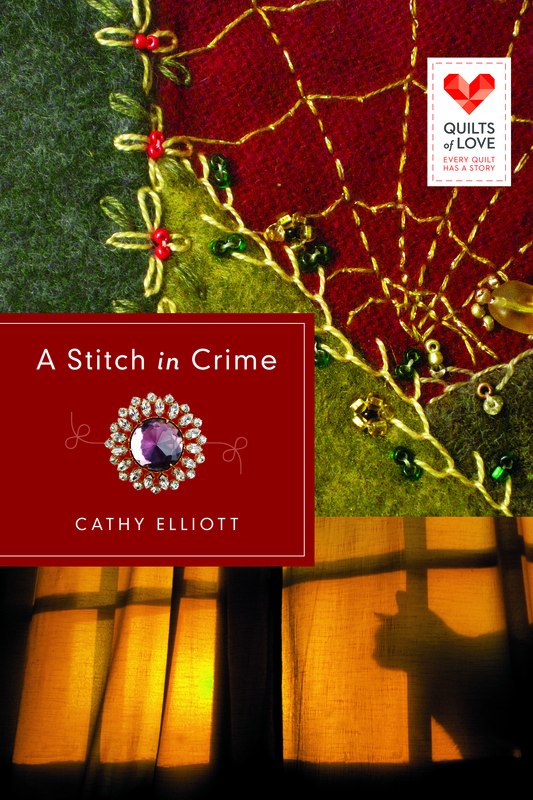 Good words for Cathy’s new mystery novel, A Stitch in Crime, from Abingdon Press and their Quilts of Love Series. AVAILABLE NOW, (in Paperback, Kindle, Audible & now as an MP3) from amazon.com. Other resources include: barnesandnoble.com, booksamillion.com, christianbook.com, cokesbury.com, and many more. Plus, in fine bookstores everywhere. Thea James thought working as co-chair for Larkindale’s first quilt show extravaganza would be a natural extension of her antique business. But while organizing the busy week’s premiere events would make anyone frayed, she doesn’t expect a complete unraveling! At the opening soiree, local matriarch Mary-Alice Wentworth is knocked unconscious and robbed of her diamond brooch. Soon a rare quilt—the main attraction and a rumored key to great riches—goes missing. Those who signed up to help Thea are strangely no help at all. What more could possibly happen? Amid a cast of colorful characters and a tight schedule of garden galas, tea parties, and televised socials, everything is falling apart at the seams—and nothing is quite what it seems. Can Thea sew everything back together? For an insider view of A Stitch in Crime, check out her Pinterest Board. READ all the latest news, reviews, & interviews for Cathy & her cozies on the NEWS page. Recently RE-RELEASED – A Vase of Mistaken Identity – a companion book to A Stitch in Crime, featuring Thea & Co. All dressed up in a new cover! Thea James, proprietress of James & Company Antique Emporium, never thought murder would come to her small, surviving Gold Rush town of Larkindale. But when the Larkindale Lamplight reports the discovery of a body during the renovation of Larkin Lake Resort, Thea is caught up in the mystery. Her world is further frenzied when she acquires a vintage vase from the town’s only homeless person. Thea finds a puzzling list tucked inside with four names written in a faded scrawl: two childhood friends from a summer camp, her sister Rosie, and. . . her own name! When the first woman on the list ends up in a coma and another mysteriously disappears, Thea knows she must save herself and her sister from harm. Her attempt to eliminate the vicious threat on their lives propels Thea to places she never wanted to visit. Will she discover the connection before tragedy strikes? A Vase of Mistaken Identity – Thea’s FIRST adventure, which continues with A Stitch in Crime. 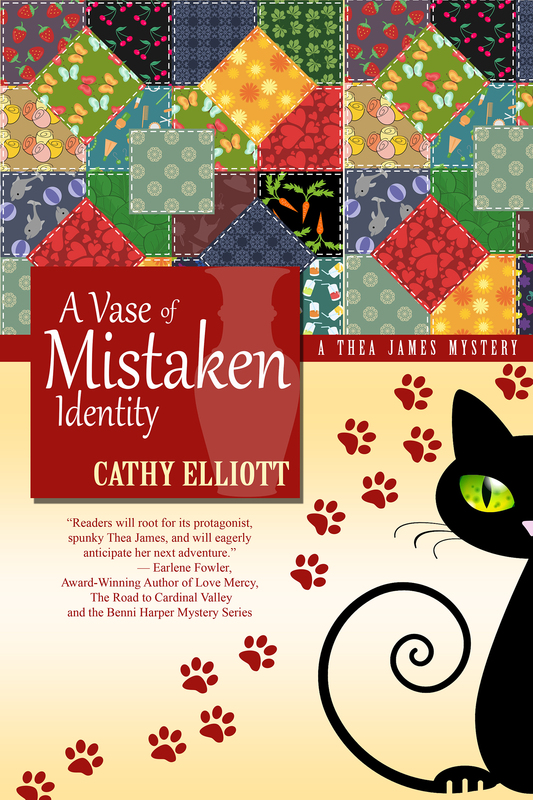 Find out more about A Vase of Mistaken Identity on Cathy’s Pinterest Board. 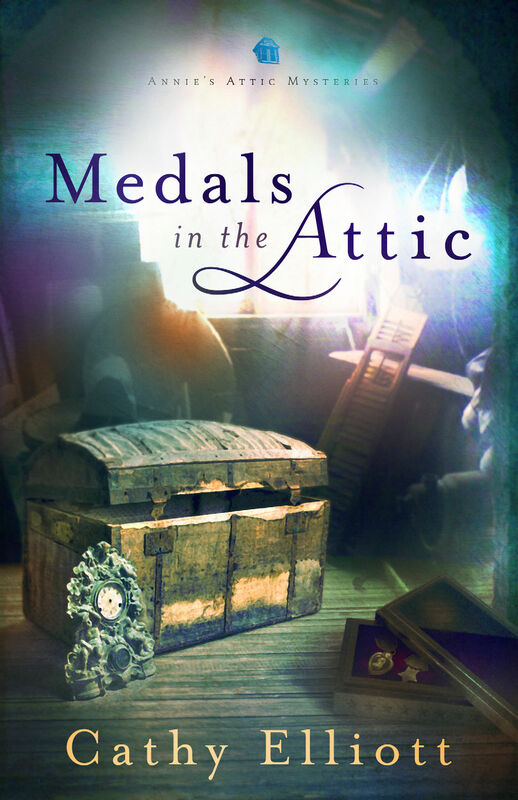 Also, enjoy Cathy’s novel, Medals in the Attic, the second book in a popular cozy mystery series from DRG: The Annie’s Attic Mysteries. One rainy afternoon, Annie Dawson finds some wonderful military medals stored in the attic of Grey Gables, the Victorian recently inherited from her grandmother. But Grandpa’s medals are all on display in the living room. So…whose medals are these? Annie is determined to find out, even if digging up the past uncovers skeletons someone desperately wants to keep hidden. Will Annie figure out the mystery before she goes too far? Visit The Annie’s Attic Mysteries web site for ordering information and to learn about this craft-themed series. A number of delightful books follow the first. And the second…written by Cathy, of course!